Exhaust SystemsThere are 9 products. Stainless steel sports exhaust system with 7 inch silencer and single oval tail-pipe that passes through rear diffuser. 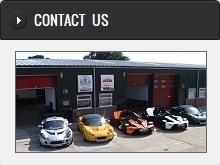 Fitment: Elise S3, Elise S, Elise 111R, Exige S2 and Exige S models. Original equipment twin-layer exhaust manifold gasket for the Toyota 2ZZ-GE engine. Stainless steel sports exhaust system with 7 inch silencer and twin slash-cut tails that sit under the rear diffuser. Fitment: Elise S - Elise 111R - Elise 2011 - Exige S2 - Exige S.
Stainless steel sports exhaust system with 7 inch silencer and twin-round slash-cut tail pipes that finish flush with the rear diffuser. Fitment: Elise S - Elise 111R - Elise 2011 - Exige S2 - Exige S.
Stainless steel sports exhaust system with 7 inch silencer and single exit tail-pipe that passes through rear grille space. Fitment: Elise S, Elise 111R, Exige S2, Exige S and 2-Eleven. Sports catalyst for all Toyota engined cars (1ZZ and 2ZZ). Designed for track use only.